ERIS COVERS THE UNITED STATES! Whether you are doing a Phase I, Phase II, remediation, loan or insurance assessment, or legal due diligence, ERIS is your fast, accurate and affordable resource for assessing environmental risk. ERIS can provide environmental database reports that meet ASTM/AAI standards, as well as the historical products of your choice to fulfill your requirements. ERIS database reports provide current and historical environmental information for any property in the United States in a concise and comprehensive manner. Key federal, state and private sector databases are researched to identify and pinpoint environmental concerns associated with a particular property. Custom radius reports allow you to conduct Information for Environmental Site Assessments in a set radius around a site locus, or to define your own custom site boundaries. Our proprietary software combines environmental site data from several different databases including federal, state, and local governing environmental records to produce a thorough and detailed report. The report highlights environmental risk features such as the storage of hazardous materials to sites with environmental liability or contamination issues. Need a quote for a unique or large site search? On the online Order Form, select “Quote – Custom Build Your Own Report” on the Select Report page. You can submit your custom boundaries by creating a specific polygon, or by uploading a site map. Custom linear or corridor environmental reports are ideal for projects that follow a line such as railroads, pipelines, roads, and tracks – where search results can be tailored to a linear property boundary. Custom linear reports can be ordered by simply providing us with the coordinates, a map, or even a site illustration by fax or by email. Our linear mapping professionals will create a custom environmental test report with the required defined distance around your linear area or corridor. The foundation of each package is an ERIS Database Report for your site of choice. The E1 includes a corresponding set of Fire Insurance Maps from our comprehensive collection of Historical products. The E2 package adds a choice of one of three additional Historical products: Aerial Photos, Topographic Maps, or a City Directory (one street). The new Physical Setting Report (PSR) will be included in every E2 to E6 package. (Prices quoted reflect ‘not finding’ or ‘finding’ FIMs associated with the subject property). The E3 adds a choice of two of three additional Historical products to your environmental database report. Choose from: Aerial Photos, Topographic Maps, or a City Directory (one street). 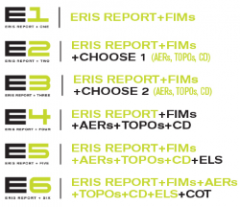 The E4 is an ERIS Database Report, plus FIMs, Aerial Photos, Topographic Maps and a City Directory (two streets). The E5 package adds an Environmental Lien Search to your Database Report and Historical information. The E6 adds a Chain of Title to your Database Report and Historical information. The offering of these new product packages will not impact any current packages or volume pricing agreements previously established with ERIS. 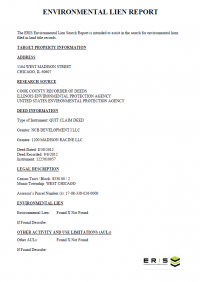 Does your company need regular access to environmental site information? Do you want answers immediately? ERIS DIRECT is for you. ERIS DIRECT is an online subscription service that provides real-time environmental risk information for properties throughout the United States and Canada. Environmental risk searches can be performed from your own computer, on specific addresses and/or company names, with environmental information delivered to you immediately. 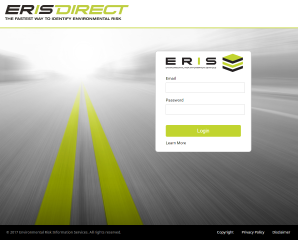 Let ERIS DIRECT make your environmental risk searches easier — and faster. ERIS Xplorer is an innovative and powerful interactive tool for analyzing environmental data and historical site images showing multiple layers of data on one screen. This platform allows the user to visualize and analyze all of the environmental risk information about a study area – all in one place, with built-in tools for analysis and customization. ERIS Xplorer can be ordered as an add-on product to any environmental Database Report, Physical Setting Report (PSR) or Historical Product, including Aerial Photographs, Topographic Maps, and Fire Insurance Maps. Overlay data and multiple images over current street layers and compare changes over time. Switch between Street, Satellite, or Terrain base layers to more effectively analyze the project property and related data. Accommodate Custom / Linear Reports for efficient review and analysis. View the transition of study area images through the decades using the Transition Tool. Filter data sources and view only the desired data sources on the map. Look up specific addresses or keywords using the Search functionality. Calculate the distance between 2 points or within a polygon area using the Measure Tool. Draw and/or add comments directly to any layer, then print to PDF for easy sharing between colleagues and clients. Save views with your drawings, measurements, notations and filters. Centralize Reports and Historical Products for the study area all in one place – no need to leave the application to download reports. Fire Insurance Maps were first published in the mid-1800s. These maps show details of urban and industrial areas such as roads, building footprints, building construction details, location of storage tanks, the building use at the time the map was prepared and the names of the building occupants. From these maps you can note the location of wells, raw material storage locations and the locations of storage tanks containing chemicals and petroleum products. ERIS has a collection of close to 1 million historic Fire Insurance Maps covering many areas of the United States. 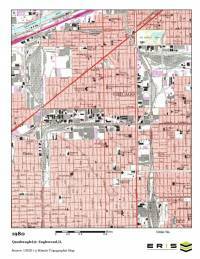 Fire Insurance Maps may be purchased along with a database report or as part of a package. 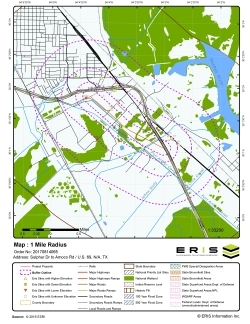 ERIS’ topographical maps were first published in the late 1800s and now cover the entire United States. Topographic maps show natural features such as wooded areas, lakes, rivers, wetlands and topographic relief. Cities and towns are depicted along with individual structures in rural areas and man-made structures such as roads, railroad tracks, dams and bridges. Certain land disturbance activities such as quarries, mines and ditches, which may have environmental research importance are often shown. ERIS provides digital copies of current and historical 7.5- and 15-minute USGS topographic maps for the entire United States. All topographic maps are in color and include a scale bar and the year created/updated. 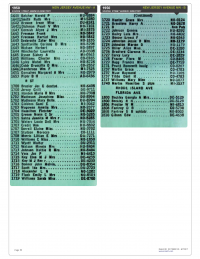 City directories are valuable historical data sources for identifying past occupants of buildings over long periods of time. ERIS has a research team of experts located at multiple research facilities throughout the country. As available, ERIS will provide digital images for your property or address range. City directory covers your site at approximate five year intervals. Specify which additional street you would like ERIS to research or we will select the street for you based on the information you provide. An ERIS representative will contact you if we discover conflicting or incomplete information regarding your site location and the streets to be researched. For many older cities, city directory coverage can date back to the early 1900s. Custom city directories can also be searched. Please contact us for more details. ERIS provides Historical Aerials either as a single purchase or as part of a package of environmental and historical information. 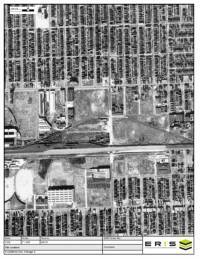 ERIS works with suppliers to provide excellent quality Historical Aerials depicting the history of land use over time. They are also used to determine where to drill and sample during Phase II projects. Most of the aerials have a scale of 1” = 500’ with a few at 1” = 800’. Each aerial photograph can show an area up to 5000’ x 7500’ or approximately 860 acres in size, dependent on the shape of the property. Larger sites or irregularly shaped sites may require more aerial photographs at an additional charge. ERIS will provide 5 to 12 historical aerial photographs of different years typically ranging from the 1930s or 1940s to the near present. Historical Aerials are offered a la carte and in ERIS’ multi-product packages. Environmental Lien is defined as: A charge, security, or encumbrance upon title to a property to secure the payment of a cost, damage, debt, obligation, or duty arising out of response actions cleanup, or other remediation of hazardous substances or petroleum products upon a property, including (but not limited to) liens imposed pursuant to CERCLA 42 USC 9607(1) and similar state or local laws. Provide a copy of the deed or cite documents reviewed. If ordering an Environmental Lien Search Report with more than one address, parcel number, Lot/Block, legal description, etc., each will be charged as a separate search. They may not follow the same chain. If your client expects to pay for only one search, please choose one address, parcel number, Lot/Block, legal description, etc. 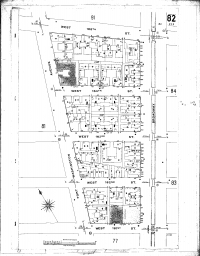 A search for a property’s previous owners of a certain piece or parcel of land, typically going back to 1940, showing recorded date, grantor, grantee, and recorded instrument information. 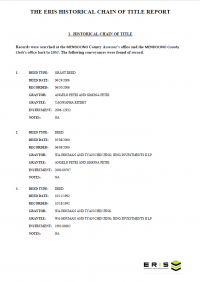 A copy of the current vesting deed can be included if requested at time of order. If splits occur (ex: current parcel was assembled from 2 or more parcels back in the 1960s), additional costs to be approved before work continues. Time required to receive approval for additional splits is not included in turnaround time. Splits must have a common back chain. Multiple chains also occur when partial interests are conveyed to multiple parties. For example, if an owner conveys 1/20 interest to ten separate owners, then each one of those ten owners has a separate ownership chain until a single party assembles them. If ordering a Chain of Title with more than one address, parcel number, Lot/Block, legal description, etc., each will be charged as a separate search. They may not follow the same chain. If your client expects to pay for only one search, please choose one address, parcel number, Lot/Block, legal description, etc. 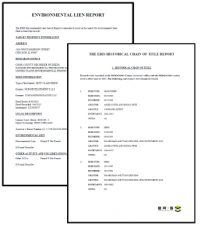 Together the environmental lien search report and historic chain of title report provide the most detailed information on the history of ownership and financial status of a property. If ordering with more than one address, parcel number, Lot/Block, legal description, etc., each will be charged as a separate search. They may not follow the same chain. If your client expects to pay for only one search, please choose one address, parcel number, Lot/Block, legal description, etc. 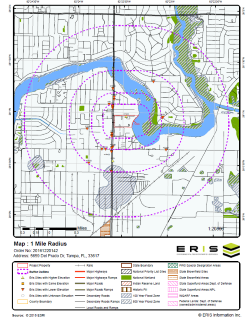 The ERIS PSR provides comprehensive information about the physical setting surrounding a site. The PSR includes a complete overview of topography and surface topology, along with a range of environmental factors – hydrologic, geologic, soil and water table characteristics. The location and detailed attributes of oil and gas wells, water wells, public water systems and radon are also included in the Physical Setting Report. Our PSR is also available for large/custom areas. Mapped categories: map units, attributes reported below. The PSR can be added to your Database Report for an additional $30 on the Order Form. Or, it is included as part of ERIS’ new E2 to E6 packages. ERIS has created a new tool dedicated specifically to assessing the risks associated with vapor encroachment. ERIS’ Vapor Screening Tool helps identify a Vapor Encroachment Condition (VEC) as part of a Phase I Assessment (complying with ASTM E2600-15). It applies approximate minimum search distances surrounding the target property to identify the default Area of Concern (AOC) and assists in identifying potential Chemicals of Concern (COC) and Petroleum Hydrocarbon COCs. The tool allows fine-tuning of the AOC based on the user’s expertise and knowledge of the site by adjusting groundwater flow direction and search distances for up-, cross-, and down-gradient quadrants. It helps determine whether or not a VEC exists by posing a list of preset questions about natural features, preferential pathways, soil characteristics, and physical barriers. Organizes the Report in a very easy-to-read format including: an Executive Summary, and vapor encroachment details for each site selected for inclusion. 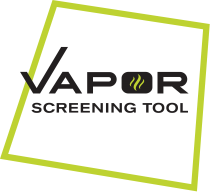 The Vapor Screening Tool can be added to any E1 to E6 Report Package for an additional $40 on the Order Form. Or, it is available as the ‘Vapor Screening Package’ which includes a Database Report and ERIS Xplorer for $150. This report provides a complete picture of property risk with detailed insight into a property’s condition and history. Get instant access to building permitted work and details, including job cost, permit type, contractor details and more, for all major systems. Permit searches are performed based on the single address input, and proper/legitimate address format is critical. The report can be ordered a la carte (under the PRODUCTS’ tab) on the online order form. Results will be uploaded to Xplorer and/or Quire and delivered instantly for download from the ‘My Orders’ page. 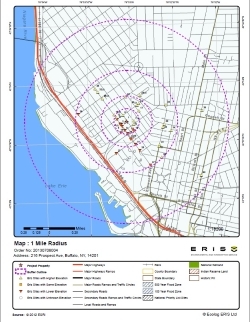 A map that displays the subject property at the center of a predefined radius and all adjacent properties that lay there within. A current aerial that displays the subject property and surrounding areas. An executive summary that indicates site information such as site name, address, elevation, latitude/longitude. A report summary that shows databases that were researched and the number of points that lie within preset search distance for each database. (Clicking on the database abbreviation will take you to the database descriptions section). 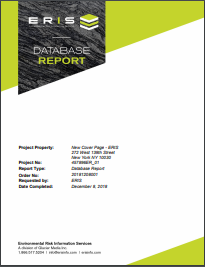 A site report summary that lists sites within the project property and surrounding properties and indicates distance and elevation difference; sites are sorted by distance and direction. (Clicking on the ‘map key’ will send you to the relevant map; clicking on the ‘page number’ will take you to that site’s detail in the detail report). A detail report of all the records found within the radius that surrounds the site; these records can be matched to locations on the site diagram by way of the ‘map keys’. An appendix that lists definitions and database descriptions.